"Surely. And what is the significance, or, rather, the effect - of the popular price admission schedule introduced by the present management in a millionaires' playhouse, which was also handicapped with a reputation for harboring high-brow stuff?" 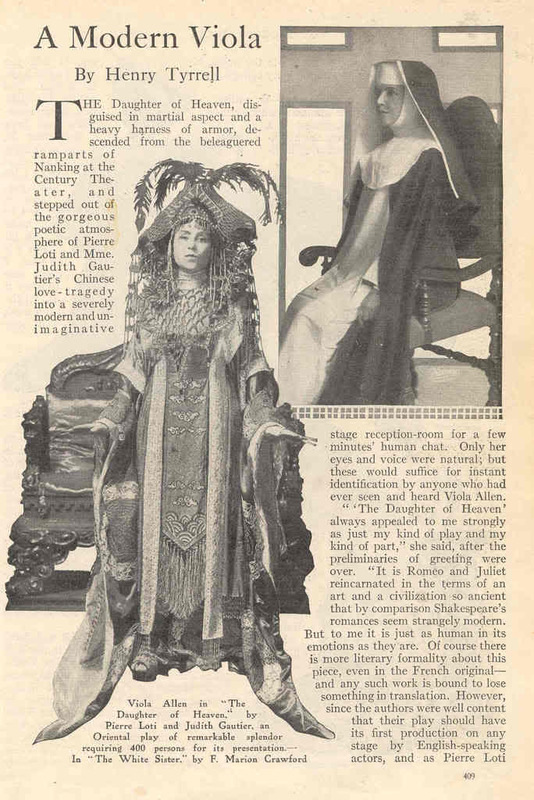 "The effect," answered the actress triumphantly, "is that now I can point to real, big, responsive audiences - like this you see to-day - and enjoy the supreme satisfaction of saying, "I told you so! I never knew it to fail. Put within the public's reach something you have conviction in, something that has made a hit with you, and it will make a hit with them. I don't care whether it is high-browed, or low-browed, so long as it is human." 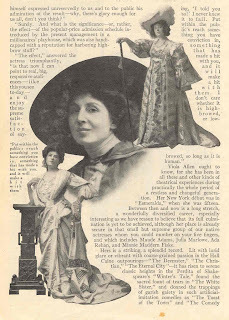 Viola Allen ought to know, for she has been in all these and other kinds of theatrical experiences during practically the whole period of a restless and changeful generation. Her New York debut was in "Esmeralda" when she was fifteen. Between then and now is a long stretch, a wonderfully diversified career, especially interesting as we have reason to believe that its full culmination is yet to be achieved, although her place is already secure in that small but supreme group of our native actresses whom you could number on your five fingers, and which includes Maude Adams, Julia Marlowe, Ada Rehan, and Minnie Maddern Fiske. Here is a striking, a splendid record. Lit with lurid glare or vibrant with coarse-grained passion in the Hall Caine outpourings - "The Deemster," "The Christian," "The Eternal City" - it has risen to serene classic heights in the Perdita of Shakespeare's "Winter's Tale," found the sacred fount of tears in "The White Sister," and donned the trappings of garish society in such artificial comedies as "The Toast of the Town" and "The Comedy Mark." Even the startling and spectacular had her recognition, though not to say any great effect, in Louis N. Parker's "Lady of Coventry," a discreet version of the same horse-back riding Eve who figures in Mascagni's most elusive recent opera, "Ysobel." "Shenandoah," "Twelfth Night," "Aristocracy," "The Rivals," and "The Hunchback," were also on her road to fame. Like all dramatic artists who put thought and intellectuality as well as emotion into their work, Viola Allen has some individual views regarding things theatrical. Everyday-experience in the real work of her profession has brushed away illusions and made her shrewd and practical. At the same time, observation abroad has widened her artistic horizon, and kept her ideals from fading. According to her, the self-sacrificing heroine will hold her place on the dramatic stage as long as she survives in real life. Yet the modern view, that the weeping, willing victim of oppression and wrong sets a harmful example, is probably correct. Optimism has grown fashionable; and the greatest acts of heroism and devotion nowadays are performed by cheerful, smiling, and perhaps well-gowned women, in a logical, undeclamatory, matter-of-fact way. Speaking of audiences, Viola Allen remarked recently (but it was before she had come to the Century Theater): "It is a grand thing to have an interested, politely attentive Broadway audience, and yet - well, it is grander to have an audience - a Harlem audience, let us say - that will take a thrill and then give it back to you. Broadway is a bit blase. Can you blame it?" 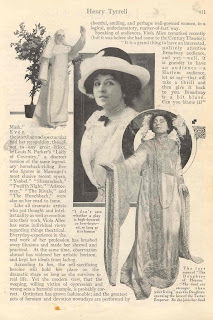 Originally published in the Cosmopolitan Magazine, February 1913.